RSMSSB Notification is out. RSMSSB is recruiting for 1085 Stenographer Post Posts. You can check RSMSSB - Rajasthan Subordinate and Ministerial Service Selection Board last date, download RSMSSB notification, visit RSMSSB official website and check other RSMSSB Vacancy details.Complete Vacancy and recruitment Details about 1085 Stenographer Post vacancies in RSMSSB are provided below by JobSarkari.Com only for you. Last Date for Apply Online 10/08/2018. Last Date for Payment of Application Fees 10/08/2018. Mode of Payment Application Fees Can be Submitted through Online Mode or Paying Cash at E-Mitra Kiosk. Stenographer (Sachivalay) Non TSP 36 15 11 08 70. Stenographer (RPSC) Non TSP 04 01 00 00 05. Stenographer (Subordinate Service / Offices) Non TSP 522 154 160 120 958. Stenographer (Subordinate Service / Offices) TSP Area 33 00 09 10 52. Total No of Post 595 170 180 138 1085. Candidate Must Have Passed Class 12th and O Level or Higher DOEACC Computer Course Certificate or NIELIT Certificate or COPA or Degree / Diploma in Computer Science / Computer Application. 3.Candidate Are Required To register before Applying for the Post already Registered Candidates do not need to Register Again. 7. Online Application Can be Submitted on or Before 10th August 2018. Q. What is the Last Date For RSMSSB Stenographer Post Vacancy ? A. Last Date for RSMSSB Stenographer Post Posts is 10/08/2018. Q. 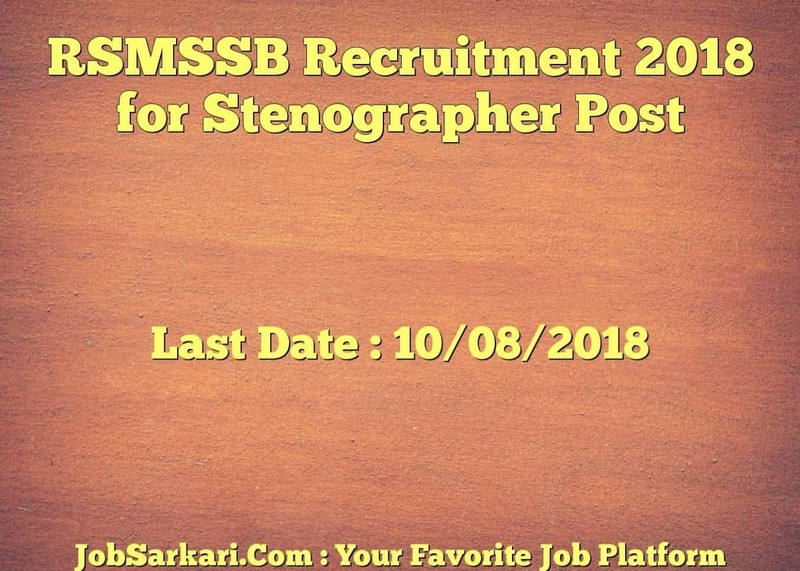 What is the Form Type of RSMSSB Stenographer Post Recruitment ? A. The Form Type for RSMSSB Stenographer Post Posts is Online. Q. How many vacancies are available in Rajasthan Subordinate and Ministerial Service Selection Board Stenographer Post Posts ? A. There are about 1000 Vacancies in Rajasthan Subordinate and Ministerial Service Selection Board Stenographer Post Posts.